If your business is growing and you need to use floor space more efficiently while creating a sense of privacy, the days of dropping hulking cube-desk combinations with tack board for walls throughout the office are long gone. The latest offices feature green friendly or sustainable materials, a small carbon footprint, and space conducive to teamwork and collaboration. Nothing offers this kind of flexibility more than the architectural partition walls from IMT Modular Partitions Ltd. The company was founded in 2001 by a commercial construction veteran and soon began marketing its premier product, the IMT Wall. A highly modular and re-configurable wall system, the IMT Wall was introduced to the North American market in Toronto at IIDEX 2002 where IMT won the prestigious Gold Award in the systems furniture category. But make no mistake — IMT Modular Partitions Ltd is not a furniture company or interior decorator. The company’s sole focus is helping business better utilize existing office space through architectural partition walls and other flexible wall systems to increase productivity and drive business. In today’s office building, it is not unusual for interior walls to support the demands of an interconnected world in the form of high speed cable and fiber optic communications systems, electrical wiring, and the capacity to accommodate heating, ventilation, and air conditioning systems. 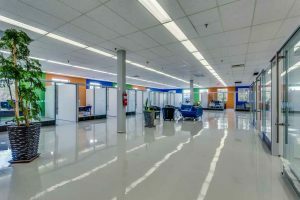 As staffing requirements change, many of these systems need to be upgraded or relocated, both of which are infinitely more simple with IMT’s modular architectural partition walls. To date, IMT Modular Partitions Ltd. has installed more than 100,000 linear feet of architectural partition walls in the North American market, with many customers located throughout the Greater Toronto Area. Some of our more notable recent projects involved installing 10,600 linear feet of modular walls for The Region of Niagara, The Weather Network, and The Canadian Institute of Chartered Accountants. Design flexibility. The IMT Wall is available in many colours and cladding options, including glass, laminate, veneer, tack boards, and white boards. Aesthetically pleasant so they blend into any interior design and can be matched with a wide range of tastes or styles. Industry leading modularity, meaning the IMT Wall is guaranteed to offer between 98 and 100 percent reconfiguration potential. The IMT Wall is made from sustainable materials. While many companies are just now accepting the advantages of environmentally friendly wall products, IMT has been at the forefront since the company was founded. By using our modular walls rather than traditional drywall, your company is committing less waste to landfills and using a sustainable product that can be reconfigured time and time again. For more information on the IMT Wall, please contact us today at 416-743-4513. You may also contact us online 24/7 and submit a request for a technical binder.